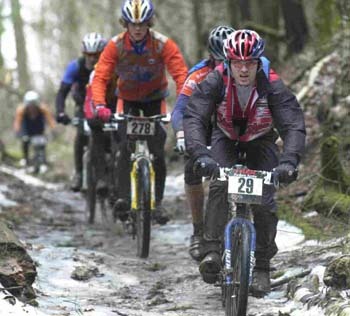 The thirteenth annual Uxbridge Icebreaker, promoted by BikeNXS, took place on March 28, 2004. The event is always held on the last Sunday in March. Although the cities and towns of southern Ontario are generally snow-free by that date, the Icebreaker takes in the higher ground of the Durham Forest, near the local ski resorts. Up here, late winter temperatures are generally around five degrees cooler than those at the shore of Lake Ontario. Most years the Icebreaker course is partly frozen, and this was no exception. Although the unpaved public roads were dry and fast, the trails were frozen below the top few centimetres and some of them were still under soft ice. I had entered the 50 km event, measured at 44 km, as it had been in 2002. I was riding my trusty True North fix, built by Hugh Black himself from Reynolds "old school" alloy tubes, mostly 531. Since I bought my True North a year ago, I've completed a fixed Tour de Cape Breton, ridden one mountain bike race and one cyclocross, and covered about 5,000 km on backroads. I feel at home on a 700c fixed rig. My main gear was 42x20, with a Soma 23T sprocket on the flip side of my Phil hub. Excitement was high at the starting line, the last race of the season being nearly six months past. I began near the back of the pack, feeling my way with trepidation. Soon, though, I found my "sea legs". I realized my Schwalbe cyclocross tires, set up tubelessly with Stan's rim strips, offered reliable grip, and I rode harder. Soon I was moving up, enjoying excellent steering precision and traction in the mud and the rotting ice. I passed so many riders on the first long road climb that I decided my 700c skinny tires must be giving me an advantage. There were miles and miles of mud, and untold volumes of meltwater running along the trails, puddles and icy sections. I've never raced in heavy mud before and soon found it much to my liking, since my equipment made it relatively easy. The watery pea soup mud was simplest to ride, if a little messy. Mud of pudding consistency was a bit more of an energy absorber, though still possible to ride and steer through - at least with my 32c tires. Peanut butter mud holds the shape of the tire rut for many minutes, and was tough to ride through, with high rolling resistance. Still, I found I could steer easily, and could climb most sections, except a couple steep ones. The piece de resistance, though, was the cookie-dough mud. It absorbed so much energy that it was impossible to ride through. We all walked these sections, even on the level. In fact, I found it necessary to pedal with some determination even to ride downhill through it. While riders fishtailed helplessly all around me, unable to steer their 26" mountainbikes, my 700cs got me through. Lots of derailleurs were seizing in the mud, and I heard many prolonged, grinding, attempts to shift gears. Fixed gear seemed beneficial in this event. I didn't see anyone else riding fixed wheel, although there were at least four riders on singlespeeds. On terrain with sketchy traction, the fixer's ability to gently modulate speed without using the brakes is a distinct advantage. Keeping my hands fully on the drops felt more secure, allowing me to concentrate better on steering and balance. 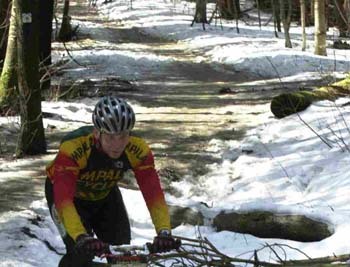 There was one section of icy, true singletrack, snaking through the woods, with log hops. I was able to ride through it in uncanny silence, using my legs to regulate my speed. Vee-brake users were emitting periodic "scra-a-a-a-pe" sounds, due to grit on the rims, and I heard riders complaining that their disk brakes were not working well enough to slow their bikes. 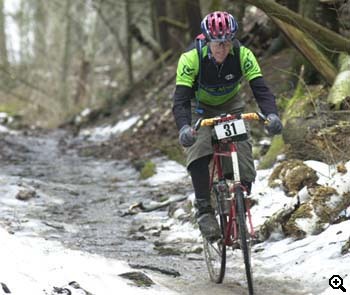 Although my pads wore noticeably during this event, my Paul Neo-Retro cantilevers worked superbly, with loads of mud clearance, reliable stopping, and easy modulation. My bike is utterly delightful. I asked Hugh to build the frame with a 12.25 inch high bottom bracket. This is great for mud riding and log-hopping. My feet stay above the mud when following a rut, which often seems to offer the fastest path. The reader may imagine that log hopping a fixed gear is a challenge. It is. A high bottom bracket helps a lot. Some fixed woods-riders report learning to unweight the rear wheel before a log, repositioning the pedals for log clearance, then hopping and rolling over the log. With many hundreds of log crossings, I can imagine doing this almost unconsciously. Not yet, though. Halfway through the second and final lap, I flipped my wheel to tackle a stretch of cookie dough. I was glad to have a slightly lower gear in reserve. I had felt a few cramps as my muscles protested about the exertion, although my strength held better than in my fixed gear race last year. My speed on the 42x20 setup maxed out at 53 km/h on the road downhill section, which by my reckoning suggests a maximum cadence of 195 rpm. Those Schwalbe 32c 'cross tires worked like a charm. Running at 45 to 50 psi, I felt the rim bottom against obstacles several times. It was good to be tubeless. When riding tubeless, I feel more confident in three ways: lower rolling resistance; better traction; and improved puncture resistance, including pinch flats. While I cannot prove these perceived advantages, I find I ride best when I have complete trust in my equipment. One modification others may find of interest: I've put a layer of 1/8" Sorbothane under my bar tape. Sorbothane is a visco-elastic, quasi-rubber material, available in sheet form. It is very soft, yet tough to tear. I cut it into 3/4" wide strips, and glued these end-to-end to make a long strip, which I wound around my WTB cyclocross bars. This reduces my hand fatigue hugely, and ends any numbness. I topped off with conventional composite cork bar tape--although I chose Soma tape, which is advertised as 20% longer than most. This comes in handy when wrapping tape over a cushioning layer. My result? Tenth out of eighteen in my class. I was 12 minutes off the pace of the leader on lap one. Only in my wildest dreams would I have imagined, several years ago, doing this well on fixed gear.